Galleri Urbane is pleased to announce an exhibition of new work by Philadelphia-based artist Stephen D’Onofrio. Two years after D’Onofrio’s inaugural solo show with the gallery, Market Research builds upon the artist’s recent use of the still life motif as an archetype for exploring the mass production of art in today’s retail-driven design industries. In these new paintings, the classical composition of a still life begins to break down, edging towards abstraction through colliding and dissected imagery. 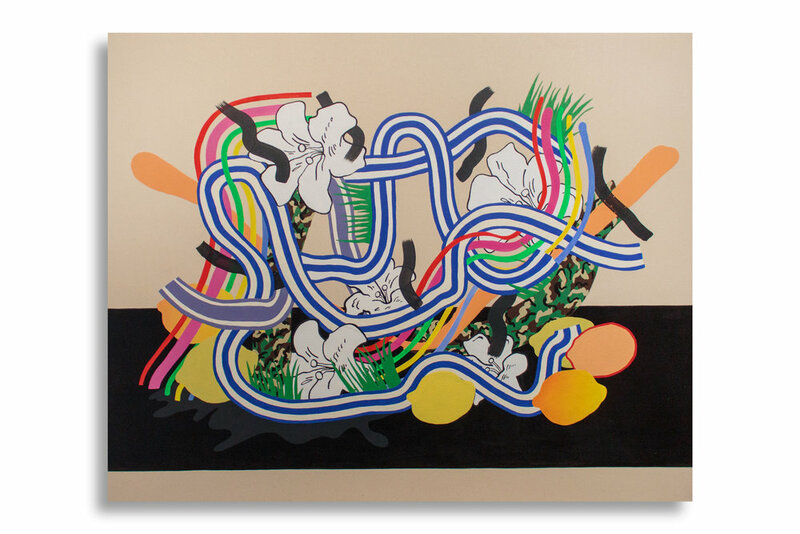 D’Onofrio’s work frequently appropriates the visual language that accompanies mass-produced design objects, drawing extensively from domestic decorative elements such as imported vases or printed wallpaper. In his recent work, the artist has taken an interest in Still Life painting and its trajectory from 17th-century Dutch Masters to the genre’s assembly-line production in today’s global capitalist economy. 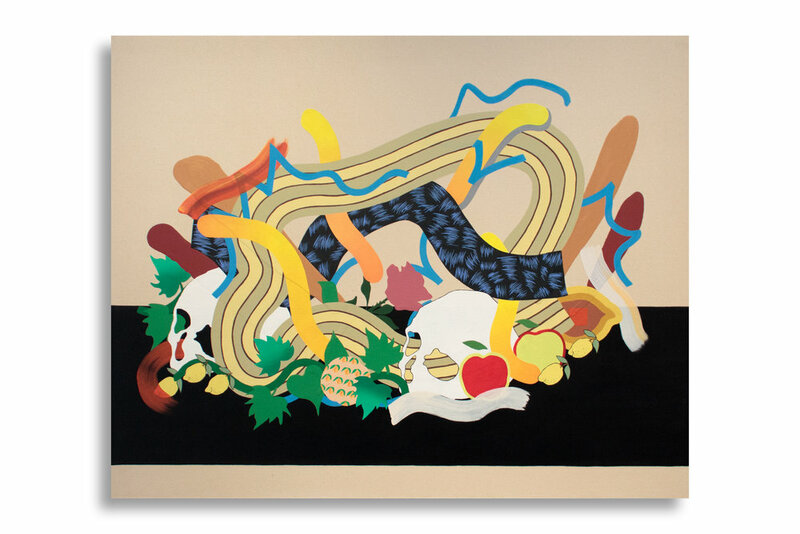 D’Onofrio’s own meticulously painted still life canvases mimic the tropes of present-day commercial design and its highly curated formalism, offering a critique of the hyper-commodified art object. Furthering this exploration, the works in Market Research have abstracted and expanded these subjects in an energetic manner. Much of the familiar source material remains intact but reconfigured in a mass of conglomerated images and color. The pop patterns of today’s commerce-saturated world are plucked from their original contexts and placed on D’Onofrio’s canvases in a whirlpool of gradients and graphic, colored bands. 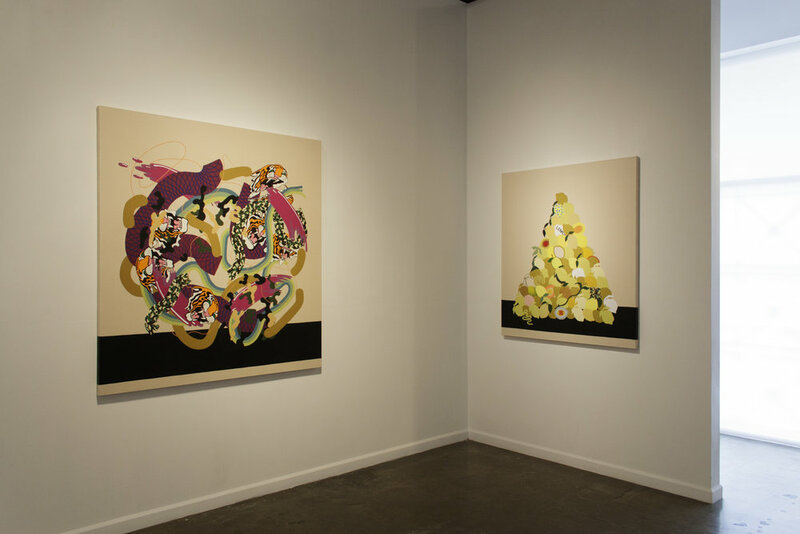 While these elements weave and tousle in the foreground, a dark plane spans the bottom third of each canvas, serving as a table top on which these assemblages can be inspected as still lifes. In this new context objects become patterns, and vice versa, upending traditional notions of the genre and offering a survey of the images that are pervasive throughout commercial design. 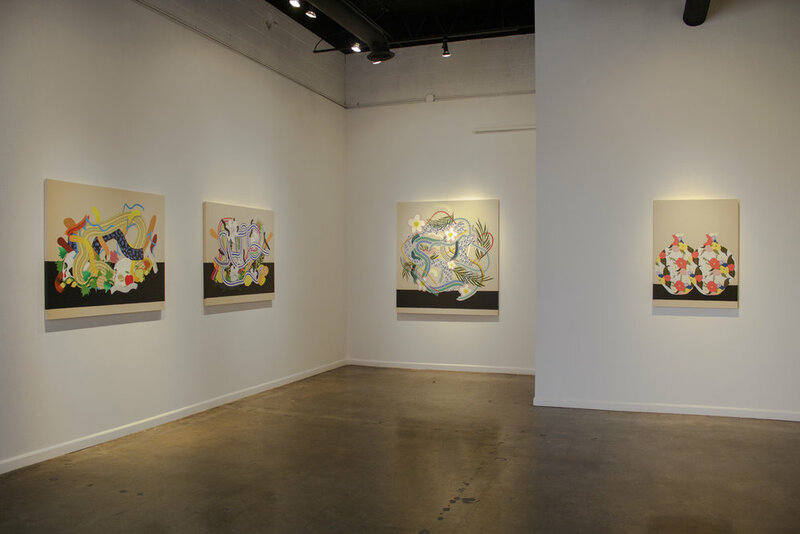 These new additions to D’Onofrio’s oeuvre altogether offer exciting technical and conceptual developments for the artist. As static mises en scène give way to dynamically configured structures, D’Onofrio’s current body of work appropriately addresses the often overwhelming frenzy of mass-produced design and art objects in contemporary culture.